﻿ 1Step Web-Video-Ripper - automatically capture and download any online video. 1Step Web-Video-Ripper is a breakthrough software for downloading and converting any online video or internet TV. Open the video in your browser with the program launched and the program saves it automatically. Convert the downloaded video and copy it to iPod or any other device. Do it the easy way and without technical knowledge. 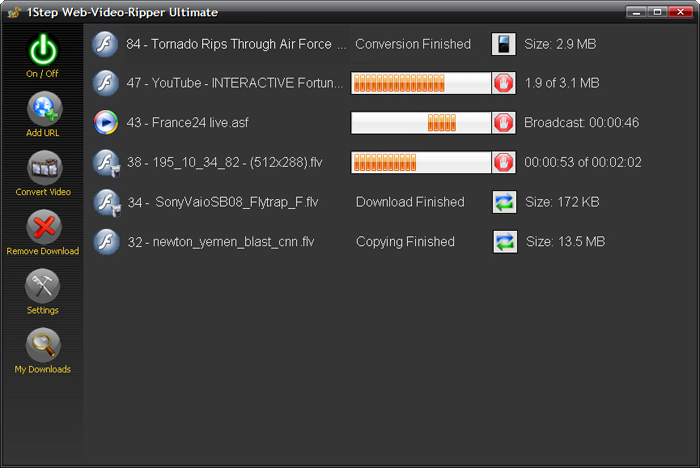 1Step Web-Video-Ripper is the most complete web video downloader. No other software can capture and download as many formats as 1Step Web-Video-Ripper. Turbo Capturing - 10 times faster video downloads! 1Step Web-Video-Ripper downloads both HD and compressed online video formats and saves them to your hard drive exactly as is. © 2006-2019 1i Soft team. All rights reserved.